These transparent stickers work with the Fancy Die Frames #FD001 and#FD002 along with the Fancy Die Shapes FD003 thru FD006. 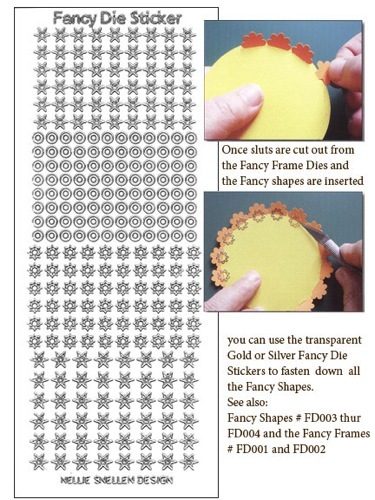 You can also use the Fancy Punch Shapes FD001 and FP001 thru FP004. The transparent stickers are used to secure the Fancy Shapes once they are inserted into the slots to complete the design. The Fancy Punch Booklet #FP000 is also available.